I have struggled with how to begin to write about our experiences with trying to have the conversation about end-of-life wishes with our providers in the last year of our daughter Justice Hope’s life. The struggle I feel is an emotional, complex, ugly web. Unfortunately, the stickiest arms of the web are formed by bad experiences and trauma; years of navigating systems that thrive in the contradiction of simultaneously valuing and disregarding your child and your parental role, value and skills. In creeps the doubt. However, in the midst of working to untangle the web, I manage to uncover the fact that it is actually not all that complex. So many of the solutions to fragmentation and failing in our healthcare system and particularly when it comes to respecting end of life wishes, lie in the simple: listening, communication, teamwork. Justice was an amazing young lady- so full of love, pure joy and wisdom. She was a straight up diva who loved music, bling and her friends and family; she was popular and influential even though she was, cue the BIG air quotes, “non-verbal, non-ambulatory and every other non- someone could be labeled.” She taught me so much about life- much more than any degree for which I have paid way too much money. This post is my first attempt to write about what happened when I tried to initiate the conversation with some of my 11-year old daughter’s providers in the last year of her life. questions, afraid to share, seen as asking “too many” questions, struggling through multiple challenges, trying to bring the shared into planning and decision-making etc.. Any feedback I give students focuses not on the issue, diagnosis or challenge, but rather on the basics of communication. 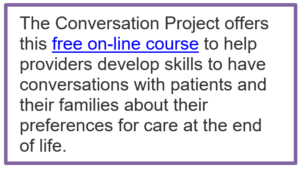 This feedback is the same when the students reflect on end of life issues: the patient who refused a terminal diagnosis, the family who would not discuss “options” other than full intervention. Communication. Listen. Ask questions. Talking Matters. 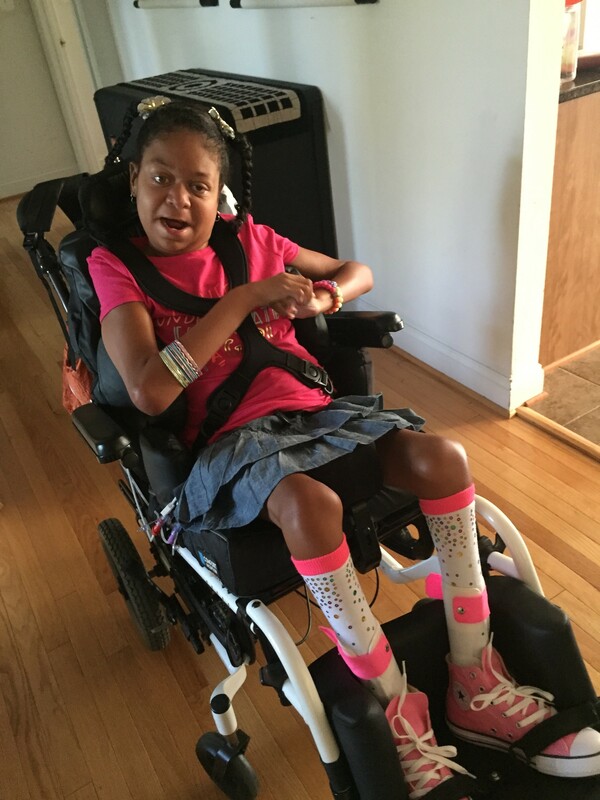 So when I began to notice changes and very distinct declines in my daughter in December 2015, I was determined not to be “difficult.” My husband and I began talking. 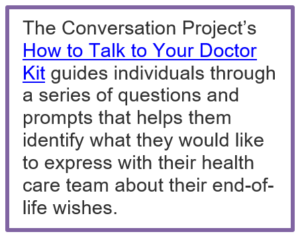 Parts of the conversation felt natural to us, particularly the foundation in wishes, priorities and quality of life, as these were the same guides we used for Justice’s life for the past decade through a world that often tried to weigh her down in diagnosis and treatment rather than hope and life. And then we began to talk to Justice’s providers. 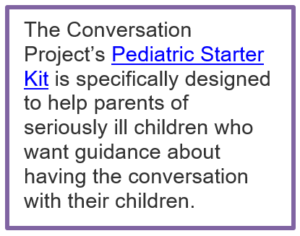 Each conversation began with a “report” that split the maternal and clinical/observations. Most important was that Justice was not sleeping, crying, not smiling and not engaging- she didn’t want to go to school some days/ was unable to enjoy it, would not cuddle with her siblings, etc.. She was having so much pain and we needed help. I specifically asked about including palliative in the care team. I laid out my understanding of what could be happening and what types of prognosis would be attached to those scenarios. Namely, we understood that if this was another bowel malrotation (her third), there was no cure. And then I laid out our wishes- the priorities that had always guided Justice’s life, namely home, family, friends, walks outside/games and activities with family, smiles/laughter, music, all that makes her happy, comfort, as they were to be THE guide for all decisions. In sharing these priorities, I also managed to croak out through tears that if and when time got short, these priorities were NOT tradeoffs we were willing to make- especially if medical interventions considered did not lead with comfort and compromised these key components of Justice’s rich life in an unnecessary, lasting and/or permanent way. Here is just some of what I got in response. I was stunned. We had initiated the conversation. We were open, honest and able to recognize the limits of medicine and the fragility of life. 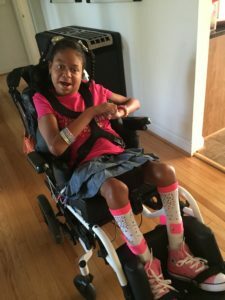 As parents of a child with multiple disabilities and medical complexity, a vast majority of our “training” is in limitations and how to make accommodations- the requirement for flexibility had kicked my type A personality to the curb long ago. How were we being difficult? And then I realized that it was not us, but rather, it was the physicians who were being difficult. While we most often discuss the inability of families to relinquish control over what is happening to their child and her health, in our situation, it was the physicians who could not relinquish control and recognize that Justice, even as a child with multiple disabilities and medical complexity, had priorities beyond merely living longer. They were being difficult because of many reasons, most notably, fear of what medicine (and they as providers) can and cannot do. The response of one of our (ok, he was Justice’s doctor, but provider and teammate for our whole family) most beloved physicians, encapsulates this fear combined with the sticky web arms of genuine emotion, ego, shame and courage. No. That answer came quickly for my husband and I, but not easily. Ultimately we reached an impasse in which medical interventions compromised Justice’s life more than they helped- and they caused so much discomfort. There is a difference between a hard death and a good death; this is even true for a child to whom no one can bear saying goodbye. A good death is not about giving up. It is about valuing life to the end in the way that matters to the patient and family. For Justice that meant spending her last day of school, which was fittingly Valentine’s Day, surrounded by the love of friends. It meant walks through our neighborhood and driveway games with family followed by all 4 siblings sandwiching into her single size hospital bed to cuddle and watch a movie. It meant being enveloped in her dad’s arms one last time with Bob Marley music playing and soft lights twinkling all around. It meant kisses, hugs, singing and tears with loved ones and special visitors. Not cold, hard hospital time away from all that mattered to Justice. In spite of everything, Justice’s last week of life was at home, surrounded by love, her death was peaceful and finally on her own terms. The weeks and months prior are what haunt me- the stickiest part of the web. And yet I still have hope and an even stronger belief in the power and critical need for the conversation- early, often, always and not just at the end of life. Cara Coleman, is a wife, a mom trying to keep her head above water and choosing joy at each turn, an attorney, an advocate at Family Voices National and the Institute for Patient and Family Centered Care, an Instructor of Pediatrics at VCU Medical School INOVA Campus and the author of “I am Justice, Hear Me Roar” about her daughter, Justice. Thank you for sharing your story! Tears streaming down my face now. My situation is not yours but some similarities. I am the sibling of a 44 yr old developmentally disabled brother with complex medical issues. There have been so many medical crises and he has had an incredible medical team, that listens and respects him and his family. All his doctors understand his need and love of family. Each crisis there has been hope, but I do wonder when the day will come when a different decision will need to be made. Thank you again for sharing your story and I know that Justice is with you each and every moment of your day! Your story touched my heart and I cannot begin to understand your grief. I was a palliative care nurse in the hospital for a year and it was the most difficult and the most rewarding job I have ever had! I cried at least 3 times a week but feel like I was able to help so many. You are so right about physicians being uncomfortable with giving up the fight. They should be taught palliative care in med school because there are times when we should not torture people instead of letting them go on their own terms. The hardest part is starting the conversation. It is interesting that most patients understand but are afraid to talk to their own family because they don’t want to hurt their feelings and are afraid they won’t understand. It always made a huge difference when I started a meeting by allowing the family/patient to ask questions. So many times it wasn’t that they were “being difficult” it was that they didn’t understand and didn’t know they could decide on their own what they wanted because no one ever asked!!! Thanks for sharing your story I hope you are able to make some changes to the behavior or member’s of the medical community because change is so needed. Good luck!!! Let me know if I can help in any way. Your words were eloquent and unfortunately so true. I lost my husband to metastatic cancer 5 1/2 years ago. Even though it was metastatic at diagnosis with an estimate of 1 1/2 year survival, palliative care was never suggested. He fought like mad and truly had quality for most of the time. That I attribute initially to an amazing oncologist but as he got sicker to the most wonderful, caring, warm palliative care physician that I can ever imagine meeting. It was only because I demanded a referral to palliative care that it happened. I have been a nurse for over 35 years. My oldest daughter who is currently a pulmonary/critical care fellow and her younger sister saw how the palliative team helped her dad to feel more comfortable and take part in family activities that ultimately he would not be able to do. They suggested celebrating milestone activities early when they knew the end was near, and he was able to hood my daughter prior to her medical school graduation. So many times I have heard from my daughter that she has argued with attending’s through her education that it was time to discuss palliative care and hospice and they refused. Any many times, she would do it anyway. The family needed to know the options. I can’t imagine losing a child but I hope that everyone in a situation like you and me are “difficult” if that is what it takes to get the best care possible for their loved ones. Thank you for telling your story.